Form and flavor find perfect harmony in this impressive pillar of palate pleasers. 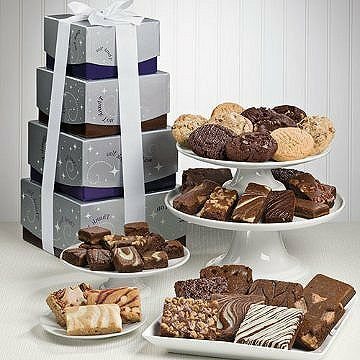 Handcrafted and hand packed with care, this astonishing assortment contains every one of the Fairytale family of flavors. This gift contains the following: 1 Chocolate Chip Brownie, 1 Original Brownie, 1 Raspberry Swirl Brownie, 1 Toffee Crunch Brownie, 1 Walnut Brownie, 1 White Chocolate Brownie, 1 Espresso Nib Brownie, 1 Cream Cheese Brownie, 1 Caramel Sprite, 1 Chocolate Chip Sprite, 1 Mint Chocolate Sprite, 1 Original Sprite, 1 Peanut Butter Sprite, 1 Pecan Sprite, 1 Toffee Crunch Sprite, 1 Walnut Sprite, 1 Espresso Nib Sprite, 1 Cream Cheese Sprite, 2 Caramel Morsels, 2 Chocolate Chip Morsels, 2 Original Morsels, 2 Raspberry Swirl Morsels, 2 Walnut Morsels, 2 Cream Cheese Morsels, 1 Toffee Chocolate Chip Cookie, 1 Caramel Pecan Cookie, 1 Peanut Butter Cookie, 1 Double Chocolate Cookie, 1 Coconut Walnut Cookie, 1 Mint Chocolate Cookie, 1 Chocolate Chip Blondie Bar, 1 Pecan Blondie Bar, 1 Raspberry White Chocolate Bar and 1 Cheesecake Swirl Bar.